Anne and I went for a 4.5 mile run this morning. She was going to have lunch with a friend so there was no time for cycling together today. I thought it would be a good day for some interval training. The weather is getting warm and I knew that it would be in the high 90’s today. so I did not want to wait too long. Around 11:00 am, I headed out on my single bike for the loop I have done before. I did not have aerobars on the bike right now and did not want to bother to put them on just for this speedwork since I need to have them off for the race next month. The good thing about doing speed work on the same course is you can compare your times between days. Since cycling speed is greatly affected by the wind, I have a loop course with each of the four intervals after I make a right turn so the wind should average out. I felt I did very well today, even though I did a speed workout two days ago running. I was able to get my heart rate up to a high level during each of the four 7 minute intervals, averaging around 165, with a maximum heart rate of around 172. With interval training you want to push your heart rate well above your lactate threshold. The recovery portion is such that you get your heart rate back down before the next interval. This chart shows my heart rate and speed. The course is not completely flat so you get some varations in speed during each 7 minute interval, but the total climb is only 400 feet for the whole loop. Notice how the heart rate goes up quickly at the start of each interval and stays in the red zone and how I slow down enough for the rest portion to get my heart rate down below 130. Click on the graph to view enlarge. 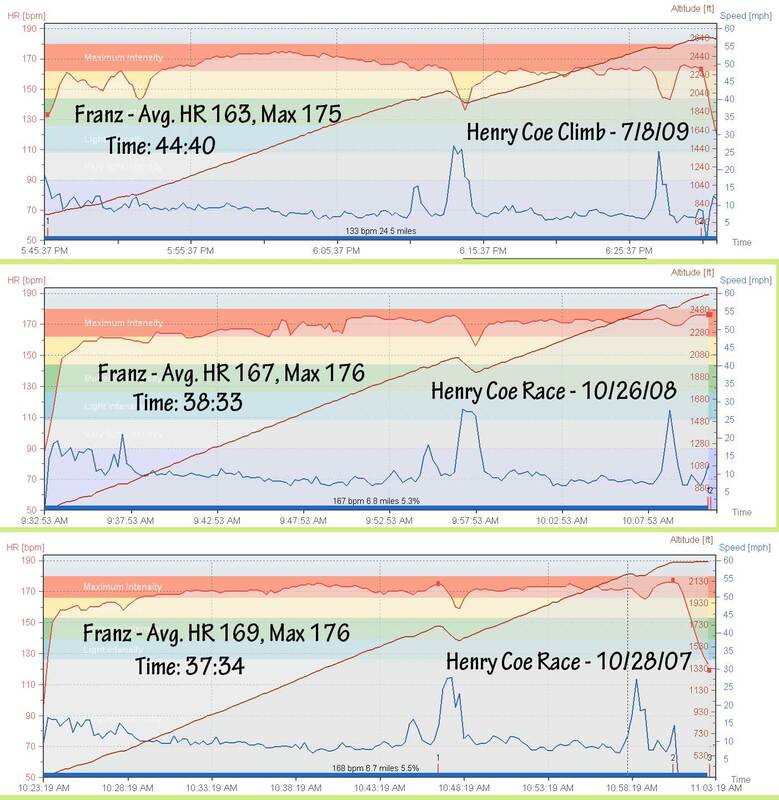 I record the data on my Polar heart rate monitor so I can compare each workout with the same course on other days. Even though I was no using aerobars today (which would account for another 1 mph) I did well compared with prior workouts, especially getting my heart rate up high, which I find hard to do on a flat stretch. 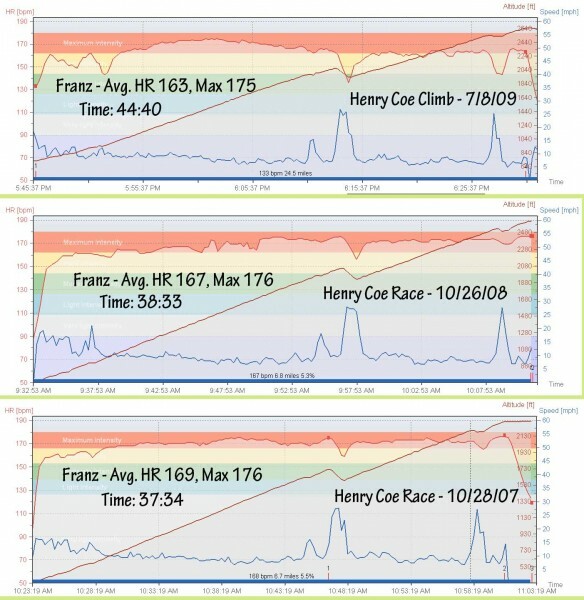 Now that we finished our 10 day long bike tour, I decided it was time I get more focused on improving my climbing speed. John and I have the Tour of Utah race next month and with 100 miles and some long and step climbs, I need to get my climbing speed back up to a strong level. On Tuesday I went on the mountain bike, which is always a tough climb. But my first chance on the road bike was Wednesday, up Henry Coe. I was riding toward the front of the pack and decided to take my heart rate up to a high level and see if I could hold it. Even after taking it over 170 bpm, one rider, Jim W, stayed with me. I figured that if I could hold that pace long enough he would fall off, which is what happened. But I was so wasted after that that I had to lower my heart rate to finish the climb. It was not the best way to set a good time up the hill, but it was a good training exercise. Here is the heart rate graph. 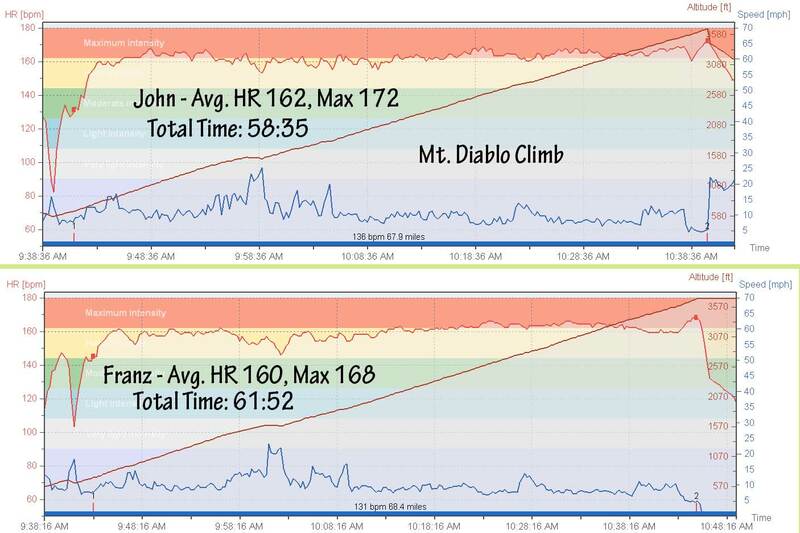 My total climb time was 6 minutes slower than my best time last year (set during a race), even taking my average heart rate to 163 for the climb. For each graph below click it to see it enlarged. The next day was the weekly Metcalf Mauler ride. This week we went on the tandem and we pushed the pace all the way up the hill. Our total time was about 1 minute slower than our best time set last year. Here again is the graph. On Friday John and Jeff were visiting. They joined Anne and I, all on single bikes, for a 33 mile ride around the reservoir. Not much climbing that day and I really needed the rest. On Saturday, John and I went to join a club ride up Mt. Diablo. Anne and I had done that same hill on the tandem last April, but this was a chance to see if I could break an hour on my single bike. As soon as we went by the start point at the South Gate, we picked up the pace. Soon after that a rider came by us and John jumped on his wheel. I kept focused on my heart rate, knowing that I needed to keep it below 160 in order to be able to keep the pace for a whole hour. My legs felt trashed from the other days this week of climbing hard. I was keeping track of my feet per minute climbing rate and after about 40 minutes I realized it was unlikely I would break an hour on the climb. It was exactly one hour when I reached the bottom of the very steep final narrow road up to the parking lot. I ended up making the climb in 61:52., about 20 minutes faster than we had done the same climb on the tandem earlier this year. John was using one of my Polar 625X heart rate monitors so I had a chance to download his data. I put both graphs together below. It is remarkable how close we were in terms of heart rate. Kind of like Father, like Son. Since John had gone ahead of me his was not quite sure where the top was and had stopped at a parking lot at the bottom of the real step final section, so his actually time would have been closer to 58 minutes. I think that is enough hard climbing for the week. I need a day or two to recover.